The patent-pending INTERCEPTOR from the The Earphone Connection is the first of its kind on the market, offering the user both Wireless capability and Dual Pairing and 2 Push-to-talk buttons. The microphone is unidirectional allowing the user to move freely without sacrificing audio clarity and quality. The INTERCEPTOR Bluetooth Microphone delivers strength and performance with 20+ hour talk time, 128-Key Bluetooth Encryption, and comes equipped with a 3.5mm audio jack for field versatility. The Earphone Connection’s INTERCEPTOR Bluetooth wireless speaker microphone with 2 PTT (push-to-talk) buttons and simultaneous listen feature can pair to 2 different Bluetooth enabled devices plus listen to dual audio from 2 Bluetooth devices at the same time. 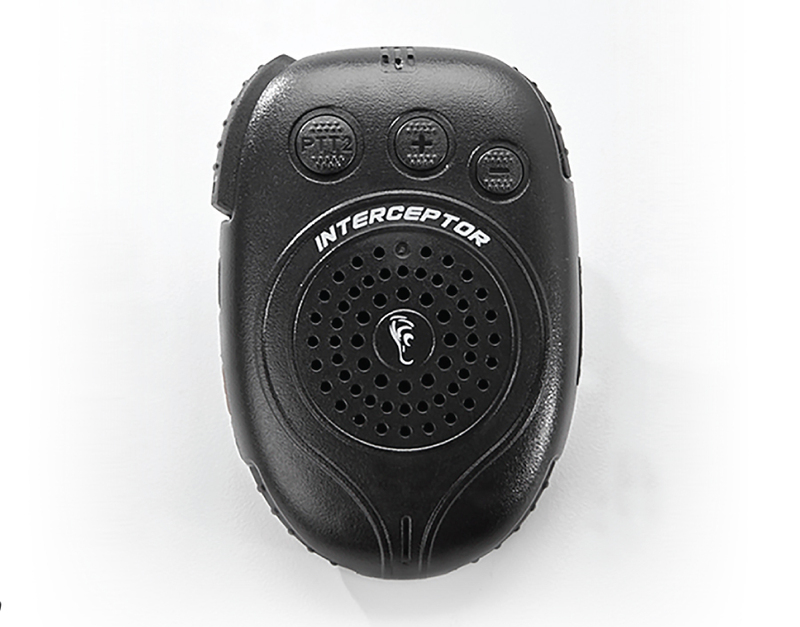 The INTERCEPTOR is able to transmit outgoing communication to two talk groups by two separate PTT controls. • Two Bluetooth enabled smartphones. • One Bluetooth enabled smartphone and one two-way radio with BlueWi Bluetooth adapter/dongle. • Two two-way radios with BlueWi Bluetooth adapters. • Pair with the BlueWi remote PTT (Push-to-talk button). 18+ Hour Talk Time. Dual PTT (Push-to-Talk) Function Pair the INTERCEPTOR and a two-way radio with BlueWi Bluetooth adapter/dongle. With Dual PTT Function, the user can control two radios respectively. In addition, the primary PTT and secondary PTT are switchable, so the user can assign priority. 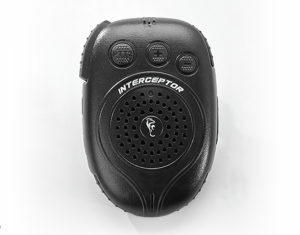 The INTERCEPTOR‘s audio clarity was designed to initiate automatic volume adjustment in response to wind, noise or outside environmental audio levels. In addition, the user can set independent automatic volume control for both two-way radio devices separately. Additional accessories include the INTERCEPTOR rapid drop-in charger and a security lanyard for secure attachment. The INTERCEPTOR retails on the Ear Phone Connection website for $275.00 USD. A Bluetooth Radio Adapter is required for most radio makes and models. Since 1997, The Ear Phone Connection, Inc. has worked diligently to deliver professional and innovative two-way radio accessories to the law enforcement industry. By introducing the earpiece as a safety-essential uniform accessory, The Ear Phone Connection created a demand for two-way radio accessories. Over time, a simple earpiece has evolved into an entire line of earphone kits that serve to keep law enforcement, fire and EMS professionals communicating safely and efficiently. With successful brands such as: Tactical EarGadgets™ and BlueWi™. The Earphone Connection, Inc. has become a leading force in bringing innovative communication tools to the consumer and professional markets on an international level. Visit our web site for more information at www.earphoneconnect.com.